Oxford, Maine - After finishing dead last in the previous week's main event, Scott Farrington of Minot arced to victory lane in the Budweiser Championship Series Super Late Model division at Oxford Plains Speedway on Saturday night (June 13). Farrington made a great move underneath reigning track champion TJ Brackett of Buckfield to claim a lead he would not relinquish in the middle stages of the 50-lapper, opening up a healthy lead over the pack that stood up until the checkered flag. In his first Oxford Championship Series Super Late Model appearance of the season, nine-time OPS top class kingpin Jeff Taylor of Farmington, after starting at the back of the Super Late Model field, chased Farrington under the checkered flag. Alan Wilson of Hebron threatened to make a repeat visit to victory lane before claiming third-place hardware. Scott Robbins of Dixfield and Auburn's Kyle Treadwell rounded out the top five, with Treadwell's last-lap move netting the top-five at the expense of the previous week's winner and reigning champion. Justin Gibbons of Bridgton and feature winner Farrington won heat races for the Budweiser SuperLate Models. Zach Emerson of Sabattus scored his second victory of the season in the 30-lap main event for Allen's Coffee Flavored Brandy Street Stocks. Emerson, who never won more than once at OPS during previous seasons, extended his lead in the Oxford Championship Series rankings. Andrew Breton of Sabattus continued his breakout season with a runner-up performance, sharing the podium with the division's leading rookie, and Emerson's closest championship rival, Calvin Rose, Jr., of Turner. Josh Childs of Oxford and Norway's Jordan Russell rounded out the top five. Childs and Breton won the Street Stock heat races. Jacob Hall of Oxford led wire-to-wire, winning the 20-lap Bandit division feature race. Hall turned back challenges from championship contender Dan Wade of New Gloucester en route to victory lane. Hall and Wade were chased under the checkered flag by Jamie Heath of Waterford, Cam Childs of Leeds and Kyle Hewins of Leeds. Childs and Hewins won the heat races for the Bandits class. Maine Racing Hall of Famer Jon Lizotte remained undefeated in Figure 8 competition, dominating the 15-lap event to again lap the field. Craig Moore of South Paris was the best of the rest, with Auburn's Mike St. Germain collecting the third-place trophy with two flat tires on the Angel Warrior 777. 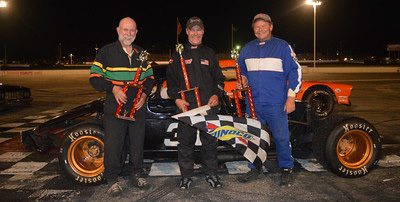 Hal Clark of Bridgton held off all challengers with his 1965 Chevy II to win the Late Model & Modified race for Wicked Good Vintage Race Car Association competitors. Studebaker driver Kevin Waterhouse of West Paris made a last-lap charge by heat race winner Steve Reny of Boothbay to claim runner-up honors. The Wicked Good Outlaw race was won with ease by Bobby Guyon of Monmouth. Bob Symonds of Casco claimed runner-up honors ahead of Freeport's Neil Martin, in a replica of a car Al Hammond drove to championships at OPS some four decades ago. 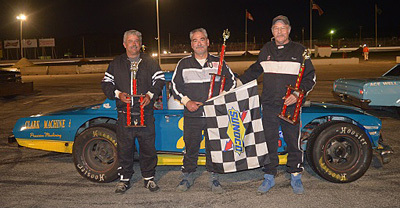 Budweiser Championship Series competition resumes at Oxford Plains Speedway on Saturday (June 20) Post time is 7:00 p.m.
Oxford Plains Speedway; Saturday, June 13, 2015. 13 72 Chris Coolidge, Norway; 14 96 Justin Gibbons; 15 5 Dustin Bisson, Greene; 16 46 Andy Shaw, Center Conway, NH. 2 33 Andrew Breton, Sabattus; 3 8 Calvin Rose, Jr., Turner; 4 3 Josh Childs, Oxford; 5 4 Jordan Russell, Norway; 6 36 Rick Spaulding, Lisbon; 7 7 Robbie Wentworth, Center Conway, NH; 8 05 Glen Reynolds, Greene; 9 777 Mike St. Germain, Auburn; 10 71 Jason LaValley, Auburn; 11 99 Matt Williams, Brownfield; 12 24 Jonathan Emerson, Sabattus; 13 63 Bryce Mains, Naples; 14 31 Wayne Reynolds, Norway. Bandits (20 laps) 1 5 Jacob Hall, Oxford; 2 17 Dan Wade, New Gloucester; 3 91 Jamie Heath, Waterford; 4 56 Cam Childs, Leeds; 5 51 Kyle Hewins, Leeds; 6 2 Shaun Hinkley, Oxford; 7 15 David Cook, Livermore Falls; 8 25 Shawn Knight, South Paris; 9 10 Michael Cleveland, Otisfield; 10 05 Gerard Cote, Oxford; 11 26 Tyler Green, Turner; 12 87 Jason Cummings, Fryeburg; 13 69 T. James Devlin, West Paris; 14 11 Guy Childs, Jr., Sabattus; 15 32 Troy Smith, Bridgton; 16 14x Adam O'Neil, Lewiston; 17 44 Rick Montminy, Auburn; 18 8 Josh Knoll, Mechanic Falls; 19 16 Adam Real, Oxford; 20 49 Derek Cook, Livermore Falls; 21 6 Greg Durgin, South Paris; 22 39 Brent Freve, Livermore; 23 33 Matt Hiscock, Turner; 24 01 Randy Henderson, Buckfield. 3 777 Mike St. Germain, Auburn. Wicked Good Vintage Race Car Association (20 laps) 1 22 Hal Clark, Bridgton; 2 2 Kevin Waterhouse, West Paris; 3 7 Steve Reny, Boothbay; 4 0 Dean Grant, Detroit; 5 59 Greg Inman, South Paris; 6 25 Mark Hughes, Milton Mills, NH; 7 48 George Harding, Fairfield; 8 91 Les Brown, Scarborough. 5 64 Scott Tucker, Winthrop.